I mentioned last week that I’ve been working on building sort of a lightweight home security system for my house so my 4-year-old daughter won’t be able to sneak out of the house again. I spent about a day researching possible solutions, to see if there was something simple that I could buy that would make me happy, and I couldn’t find anything on the market that was cheap and would tell me which of my 6 exterior doors had been opened loudly enough to hear from across the house. There’s no point in putting a door buzzer on the basement door if you can’t hear it from the master bedroom. The only solutions that I found were from professional alarm companies, and they probably would have charged me a couple thousand for installation plus $30-$50 per month for monitoring. I’m just not willing to pay that much, and it’s not really what I was looking for–it’s gross overkill for my problem. So, I decided to build it myself. 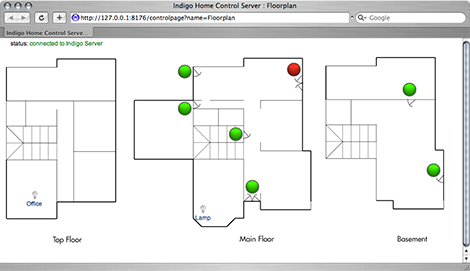 After a few hours’ searching, I decided to use Perceptive Automation’s Indigo home-automation software for the Mac. It’s commercial software, but I like its user interface and capabilities better then any of the open-source solutions that I’ve seen. It’s under active development, supports just about everything that I need, it’s client-server so I can access it from any Mac I own, and it comes with a nice web interface that I can get to via my phone. I figured that it’d be cheaper to pay the money for Indigo then to spend most of a week hacking away at one of the open-source packages to get them to do what I want. Plus, er, pretty much every open source home automation program that I could find was written in Perl, and I’ve been successfully avoiding Perl for almost 5 years now. The last thing I really want to do is spend a week modifying someone else’s Perl. That kind of thing gives me nightmares. So I fired Indigo up on an old Powerbook that I had laying around and bought a bunch of hardware from MacHomeStore and SmartHome.com. The important bits are a W800RF32A wireless reciever and a whole bunch of $12 DS10a door and window sensors. The sensors broadcast their state over the air, and the receiver feeds them into my Mac. That took care of the input side of the equation, but I still needed some relatively cheap way to play audio around my house. I poked around for a while looking at random X10 hardware and radio solutions before I realized that most VoIP phones support audio paging. Since my house is full of VoIP phones and I run my own Asterisk server, all I’d really need to do was write a couple dozen lines of Asterisk dialplan code, and everything should just work. I ended up ordering two new VoIP phones (Grandstream GXP-2020s) because two of the phones that I have are too old to be usable for paging. I probably could have used $45 Budgetones, but I have future plans for the GXP-2020’s big displays, so I decided to spend a bit more for them. 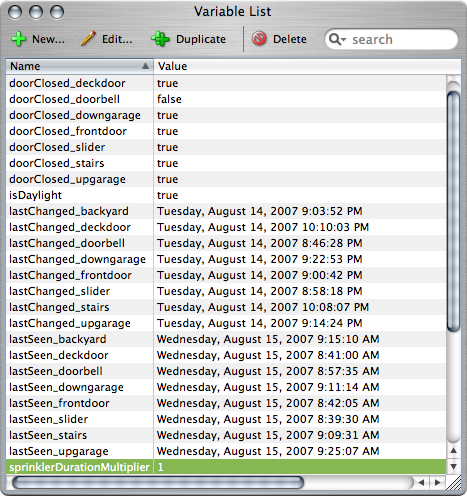 Door sensor tracking code for Indigo and Asterisk. VoIP phones with a device-specific message. 1. I have the extension name handy here, while I'd have to parse it back out of the variable name if I used triggers. 2. Creating an identical trigger for each of 10+ sensors is a pain in the neck. 3. We need to do *something* with unknown sensor events, but creating variables for them is pretty clearly wrong. 4. My AppleScript is lousy, and I can't get triggers to call doDialOut correctly. using terms from application "IndigoServer"
-- stuck writing code in blub. -- Indigo variable names are derived from Asterisk extension names. -- for doorbells or motion sensors. Feel free to change this. -- but we only care about normal/active. -- Create the Indigo variables if they don't already exist. -- Did the value of this variable just change? -- If it just changed and it's now false, then send an alert. -- The DS10a sensors send a signal once per hour, even if nothing's changed. -- So we don't want to alert *unless* something's changed. -- We need to keep track of the time that each DS10 was last seen. -- This way we can spot bad batteries. -- runs on the same machine as Indigo. -- extension names used at the bottom. log "Paging extension " & extension using type "Dialer"
Exten: " & extension & "
set results to do shell script "/usr/bin/expect -c  '" & expectscript & "'"
; Cisco 7940; no Call-Info support, but you can create a new line and turn on auto-answer on the phone. ; Sipura 841. It needs a semicolon before answer-after. ; Grandstream GXP-2020s, although the same config will work for most modern phones. Then I just had to record some audio files to use for annoucements. The easiest way to do this is just to call yourself up and leave voicemail, and then copy the VM files over into Asterisk’s sound file directory, usually /var/lib/asterisk/sounds. You could get better quality recordings with a good microphone and audio-processing app, but I’m not sure that there’s really a point, given the quality of most speakerphone speakers. All told, it took me about 8 hours of research to put this all together, and maybe 10 hours to implement it all, including learning a bit of AppleScript. Now I have a programmable system for monitoring my house, and all of the pieces in place for adding X10 or Insteon components as they make sense. It’s all under my control; if I can code it, then I can make it happen. So, does it all work? Yep–Monday morning it caught my daughter trying to sneak into the garage. Mission accomplished.